In April 2017, we relaunched our Overseas Trainee (OT) program, and we have stationed one young employee in Thailand. In this new program, we are focusing on providing real work experiences at overseas affiliates, and on language studies to enable trainees to work alongside local employees using the local language. The trainees in Thailand attend language school to learn Thai while working on specific training topics. We believe this system will improve understanding of the local languages and cultures, and enhance relationships with local staff member. As we increase our physical presence around the world, we are providing more opportunities for our young employees to work overseas. 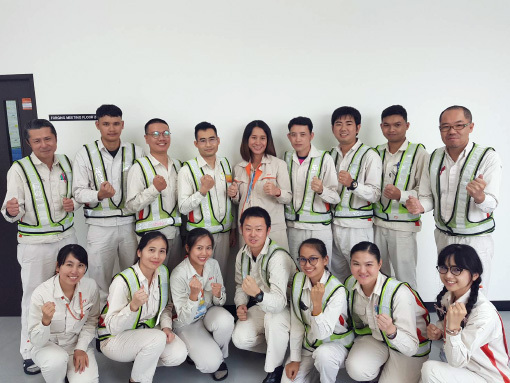 The real-life experiences provided in this training system help participants understand the significance of working overseas and the importance of communicating in the local languages, and through that we hope to help them grow into globally-active employees of Aichi Steel. We are developing human resources who are capable of working globally through a program of overseas business and language training. In April 2017, we renewed our Overseas Training (OT) program, and we have stationed one young employee in Thailand. In this new program, we are focusing on providing real work experiences at overseas affiliates, and on language studies to enable trainees to work alongside local employees using the local language. The trainees in Thailand attend language school to learn Thai while trying to accomplish achievements on specific training topics. As we increase our physical presence around the world, we are providing more opportunities for our young employees to work overseas. The real-life experiences provided in this training system help trainees understand the significance of working overseas and the importance of communicating in the local languages, and through that we hope to help them grow into globally-active employees of Aichi Steel. Since August 2016, we have been providing specialized technical training for all skilled workers in forging plants to provide systematic training on the knowledge and skills needed at those plants. To raise understanding and lead to improvements in the purposes and “why” of each task, the roles of skilled workers, from the fundamentals of manufacturing to the essentials of the facilities that create products and measures for dealing with abnormalities, are divided into three ranks (Rank C, Rank B, and Rank A), and the training is organized so that workers learn in steps (Rank C: five years after joining the company; Rank B: 10 years after joining the company; Rank A: first-level supervisor). The hands-on training combines knowledge learning and practical skills acquisition. Trainee proficiency is confirmed through written tests, and determinations of whether trainees have reached a level that can be used in practical work are confirmed through presentations on examples of improvements and on-site monitoring. Trainees who pass receive ranked certification. We started Rank C training in fiscal 2016, and Rank B training in fiscal 2017. By having all skilled workers undergo this training, a culture of asking “why?” will be created and the handing down of technology and skills to successors will be encouraged. A program to foster training instructors for skilled workers was launched to create a culture of teaching and learning. The instructors were put to work training young workers from 2018. Going forward, a system of education will be implemented to foster instructors at each plant, with the system also aiming to provide instructor skills to all managers and supervisors.